I was involved the past few days with a wedding that I photographed; I was at the rehearsal dinner on Friday and enjoyed some vegan Papa John's pizza (not bad), and (I forgot to mention that the bride and groom are also vegan!) ate at the wedding yesterday (potato salad, pasta salad, and other items, including a delicious coconut milk-based cake that I had helped to formulate a few years ago at a local bakery). We have a friend visting for a few days, and I had to apologize that she would only get one home-cooked dinner; she arrived on Thursday and she, my wife, and I ate out at a favorite Italian restaurant after my class. My wife is involved in a week-long course, so tonight I cooked for our guest and myself. I made a similar "pizza" to what I did about a week ago. I also sauteed some slices of tempeh and then dredged them in a jerk seasoning, and also served some corn that I had roasted on an open flame (of my gas range), then stripped and mixed with Earth Balance margarine, salt, and lemon and lime. We both enjoyed the meal! First the good news - the dermatologist called yesterday to tell me that the tests came back negative - I don't have chicken pox! The bride, groom, my wife, and I, all came down with what appears to be insect bites that are itchy but not contagious!! Yeah!! We are lucky to have a relative from New Delhi visiting my parents. Yesterday, my wife and I went to meet her (after I got the good news!) and we all ate a nice Indian meal there. Tonight, I had all over at my home for dinner (all except my Mom who was fasting today; she ate a simple dish that she made with us). Last Saturday (the 14th) at the farmer's market, I purchased Cranberry Red potatoes. Also known as All Red, it is a potato available since 1984 that is supposed to have a rich pink/red coloration on the inside and outside, and that is said to be very nice for making potato salad. I made a simple saute with these potatoes (which turned out, at least this batch, to be light in color inside), tempeh, asparagus, sweet and red onions, and a little soy sauce and salt. 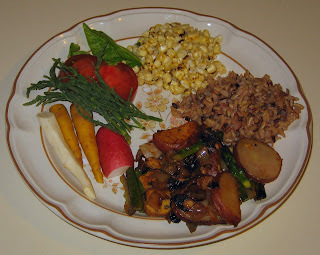 I served this with a mixed brown and wild rice combination that I had cooked in vegan broth, as well as grilled corn-off-the-cob with fresh lime, Earth Balance margarine, and salt. On the side, I also had heirloom tomato, baby yellow carrot, parsnip, and sea beans (which I don't enjoy the taste of - quite salty! - but they're nutritive). I've made significantly better dinners lately, but all seemed to enjoy. 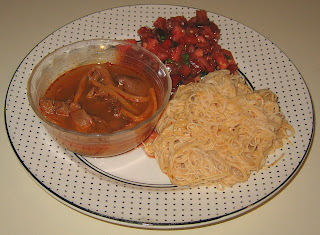 Several Thursdays ago, I had made stewed eggplant that I served over pasta. I had in mind an interesting pizza where I would start with some tomato paste, then the leftover eggplant, followed by chunks of freshly grilled eggplant. We had some frozen dough but decided it would be too much close connection with kneading that would be required; let the infection pass! Instead, I made something a little simpler but based on that idea. I used slices of three different breads - whole wheat, olive, and lemon rosemary - and sprayed a little bit of olive oil on the bottoms. I put no tomato sauce on, but spread the warmed eggplant sauce. In my cast iron pan, I had sauteed small (approx. 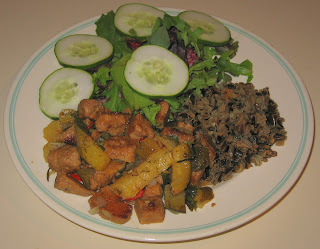 1/4" cubes) pieces of tempeh for a few minutes, then, as they were browning, added maybe 1/2" cubes of eggplant. (This isn't the best way to cook eggplant, as it sops up the oil; I could have first, but didn't, salt and let sit the eggplant.) 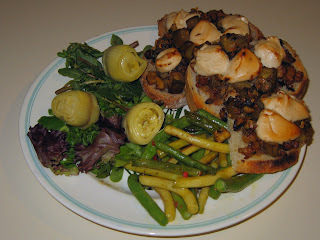 When the eggplant was cooked and slightly brown, I put this crumble atop the bread slices. On my three slices, I also added dollops of the new vegan Scottish "Sheese" "cream cheese", regular flavor. I put the topped breads in a 350°F oven and baked for about 10 minutes, then turned the broiler on for just a minute to slightly darken the "cheese". I served, along with beans that I had prepared the way we loved in Toscano last October - simply cooked shortly in olive oil then mixed with fresh lemon juice (I used lime), salt, and pepper. Dinner was filling and good! For dinner, it was late and I wanted to put something on the table reasonably quickly. I was thinking of doing something with the delicious lemon rosemary sourdough bread, and thought of the bread salad (panzanella) that is often one of my cooking class students' favorite dishes. I made a shortcut version of this dish; I cut up several slices of the bread, as well as a few slices of a black olive bread, into roughly 3/4" cubes and tossed in a big bowl with a tablespoon or tablespoon and a half of olive oil and several diced garlic cloves. I put the coated bread on a flat tray, which I put in a preheated 350°F oven for about 20 minutes to get toasted croutons. I mixed the croutons with diced tomato, lemon cucumber, and sweet onion, along with fresh oregano leaves, shredded basil, and rosemary needles, as well as a little rosemary vinegar and salt and pepper. I covered it and let it marinate in the refrigerator till we were ready to eat. I also sauteed some tempeh (always tasty). Finally, I grilled some corn on the gas range's flame, stripped the kernels, and mixed in Earth Balance margarine and salt and fresh lemon juice. By the way, tonight I conditioned my new polished steel paella pan. I washed it with soap (for the first and only time, presumably), dried it thoroughly, then added a thin coating of high flashpoint canola oil to the bottom and sides and let it stay on a low-medium flame; the picture shows it 15 minutes into seasoning (the inside is supposed to turn brown). My wife shopped at the Carrboro Farmer's Market this morning and brought home a number of welcome items! One item was a green that I saw the previous weekend but whose name (starts with a "p"?) I've forgotten; it can be eaten raw or cooked, and consists of little few inches long segmented stems with leaves. She also brought home something I'd never heard of, lemon cucumbers! She brought two varieties, one yellow splotched, and one white; I took pictures! 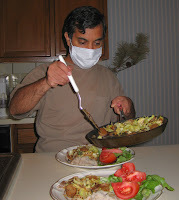 For dinner (my wife took a picture of me in my mask! ), I chopped a small red onion into 1/4" cubes and started sauteeing over medium heat. A minute or two later, I began adding lacinato kale as I hand shredded to about one inch pieces, composting the fibrous stems. It only took a few minutes for the kale to soften and cook down a little; I then added a handful or so of the green whose name I can't recall and, a minute or so later, a few teaspoons of cumin seeds, two pinches of turmeric, and a little salt. Another minute and I served it. Weaver Street Market makes this delicious lemon rosemary sourdough bread on weekends only and I had such great memories of the "pizza" that I had made with it last weekend, that I was tempted to try a variant again. 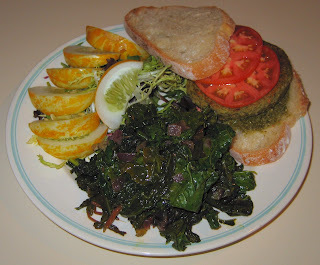 Instead, I grilled a Garden Herb Organic Sunshine Burger and served it on untoasted bread, with a little pesto and heirloom tomato slices. Dinner was very good! The lemon cucumber had a nice, mild flavor. I hope that we can find these cucumbers again! At the farmer's market last week, a farmer was selling what she called "baby cabbage" - we were having dry weather so rather than let the cabbage wither or be irrigated, she picked them young and tender. I cut open the two baby cabbages that I had purchased, made a "v"-shaped cut to remove the core, and sliced the cabbages into strips. I cut up an artisanal vegan apple-sage sausage by the Field Roast Grain Meat Company and began sauteeing it, along with half-moon slices of red onion. 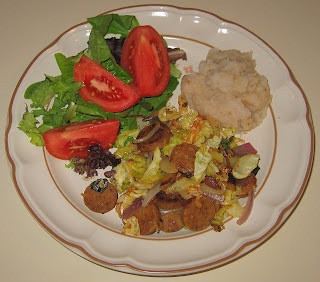 About five minutes into the saute, I added the cabbage. Once the cabbage cooked down a bit, I served it (I had wanted to add caraway seeds to the last few minutes of the cooking, but didn't have any). I didn't think it matched yesterday's meal, but we, particularly my wife, enjoyed dinner before she had to run off to the American Dance Festival (how I wish I could go!). Dinner came out great! It was one of the best meals that I remember putting together in some time. I cut thin fingers of tempeh and sauteed them with red onions, mild green peppers, and oyster mushrooms. I soaked some fine rice noodles for a few minutes till they were soft, and put them into the saute when that was done, stirring the noodles along with a little soy sauce and ample hand-shredded fresh basil. It was very tasty!! 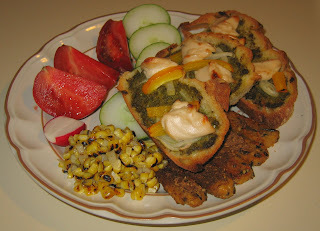 I had also recently purchased millet and flax garlic "chips" (they're actually low-fat crackers), and we tried them - wow! They are full of flavor and are likely to be a new staple for us. I didn't have much time to make dinner today; I had an afternoon meeting with the new Chapel Hill Senior Center (what a delightful staff and gorgeous facility! ), who are interested in my classes (we're going to give daytime cooking classes, as well as a film study class, a try in September). The meeting went great and took longer than I had expected (I developed some itchiness yesterday and my meeting's length caused me to have to delay my doctor's appointment to Friday) and, since we had tickets to American Dance Festival tonight, I had to put a meal together quickly. I had brought home about half of my paper masala dosa from Sunday and I gently reheated it in my toaster oven, and served it with the leftover coconut chutney. I had stopped at Whole Foods Market, and picked up already prepared hot mushrooms with herbs and marinated in balsamic vinegar. I simply roasted some corn and served it with Earth Balance margarine, salt, and lime juice. This past weekend, I had picked up "lemon tomatoes" and served them today - they tasted good, a little sweeter than typical tomatoes with a hint of tartness. I was recruiting high school students for Johns Hopkins, my alma mater, at a college fair today, and started teaching a new photography class tonight, for the first time for the Town of Cary. Rather than eat out on both Tuesday and Thursday (when I teach photography for the Carrboro ArtsCenter), I put some wild rice in my rice cooker with water (in a 4:1 water:rice ratio) and a vegan bouillon cube and set it to be ready in the evening, and came up with a dish that I could quickly make. Yesterday, I found a nice product, tasty grilled zucchini, and purchased it. When I got home, all I did was thickly cut seitan into 3/4" cubes and begin sauteeing them. I cut up a medium onion fairly fine and added that a few minutes later. Maybe 5 minutes later, I added slices from a quarter each of red jalapeno and a milder green pepper, as well as a tablespoon or maybe a little more of fresh rosemary needles. A few minutes later, I added a tablespoon or so of chopped fresh basil and the zucchini and just cooked an additional minute. I added a generous amount of dried dill weed (maybe 2 teaspoons?) and served. It was very good! Tonight, I made a simple dinner just for myself. I had a new student with whom I started a 1-on-1 tutorial on digital photography with her new camera, and I had a professional photographer's meeting shortly after the teaching. So, I ate late and my wife had something to eat at my parents' house. Yesterday, I took my wife to a meeting with a bride and groom whose (vegan!) wedding I'm photographing in two weeks. After scoping out the site and taking some pictures, my wife ended up hungry, so we had an early dinner at Udupi South Indian restaurant; I had a paper thin masala dosa. I came up with a tasty idea today; I visited the farmer's market today and then Weaver Street Market, where, on weekends only, they make this fabulous lemon rosemary sourdough boule bread. It's soft with a not too crispy crust. They also had a new prepared Rising Moon Organics' vegan pesto sauce! For about 15 minutes, I heated my oven, that has a big pizza stone in it, to 400°F. 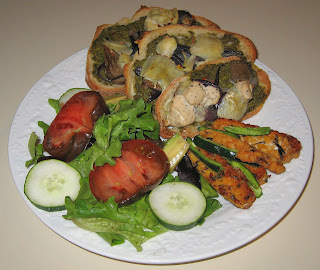 I sprayed on a light coating of olive oil to one side of slices of the bread and put a thin coat of pesto on the other. I sauteed some oyster mushrooms and, from the farmer's market, sweet red onion, and put that, as well as sliced artichoke heart, on top. On one slice, I put some of the Isle of Bute vegan garlic and herb "cream cheese" (it melted and tasted great - I'll do something like this again and use more of the "cheese"!). I put the slices on the hot stone and let them cook for about 10 minutes, still at 400°F. The "pizza" came out exceptionally good - better than I had expected! The stone did exactly as it was supposed to - it created a lightly toasted crust, not too hard for my recovering gums, and the combination with the soft top was great. The toppings really made this fabulous. I'll make something like this again soon but with perhaps a tomato instead of pesto sauce. 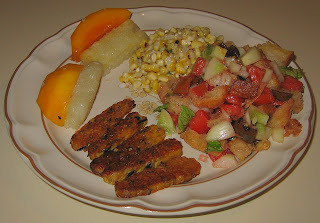 I also made a salad and a quick saute of tempeh with mild green pepper. We enjoyed dinner! Yesterday, by the way, we went with several friends to the Paul Taylor American Dance Festival performance (excellent! ), and we ate out beforehand at Xiloa, the Nicaraguan restaurant we like in downtown Durham. I had my regular there, the nacatamales. The eggplant that I started last night in my 1.5 quart slow cooker cooked about 8 hours, from approximately 11a till 7p. I turned the heat off and tasted the sauce; it was okay but too subtly flavored, so I diced about a quarter of a red jalapeno pepper and mixed it in, as well as fresh herbs from my garden - about a teaspoon of oregano and maybe a tablespoon of coarsely chopped basil leaves. 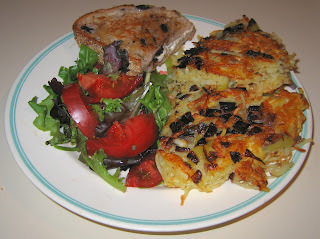 Perhaps the proof of the dinner was our guest who claimed to dislike eggplant - and she loved the dinner. My wife did, too. 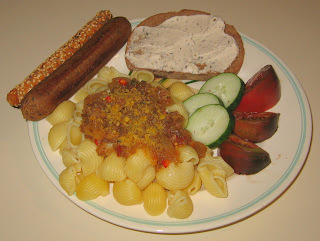 I thought that the sauce could have been a little more flavorful, and would like to try something like this again, but add less eggplant and more tomato, and perhaps add some other ingredient, such as capers or, at serving time, dried fried onion bits. It's great to be back to cooking and getting back to more normal eating after my wisdom teeth extraction. Late this afternoon, we got a call from a Servas traveler from New Orleans who was stuck and needed to come visit us early (we were expecting her next week); I had plans so my wife received her. I felt bad that she'd be eating late as I didn't get home till after 8p, but she was fun to meet and cheerful about dinner. My gums are still a little sore, but I thought I might make some boiled potatoes. 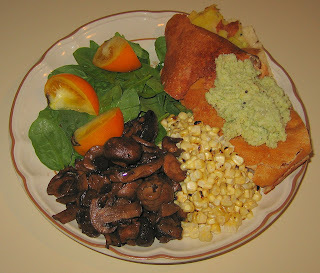 I used small organic (unpeeled) Yukon Gold potatoes and boiled them. When they were done (I let them go a little long to get them softer), I drained them and put them in a bowl and gently smashed each one with a fork (just to pierce the skins and press into the flesh a little). I added some prepared vegan pesto sauce, fresh oregano and diced basil from my garden, finely diced shallot, and a few capers. 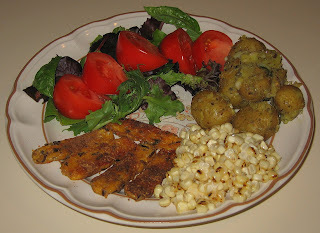 While I was on a soft food diet of mashed potatoes and the like, I was fantasizing about sauteed tempeh. I made that today, but only took a few pieces and carefully ate them, being aware of their crispy and hard edges. I rubbed some Jamaican jerk seasoning onto both sides and, with the excess seasoning, mixed into the potatoes. I also served flame-roasted corn with Earth Balance vegan non-hydrogenated margarine, fresh squeezed organic lemon, and a little salt. I was afraid that this would be a "below average" meal but we all enjoyed it. In fact, our Servas visitor had warned me that she didn't like corn but not only did she love all the side dishes, she said this corn was unlike any previous preparation she had, and she also loved it!! I was up very late, and, starting at 4 a.m. (!! ), I began assembling ingredients in my little slow cooker for dinner tomorrow. I had purchased a huge eggplant; I peeled it and cut half of it into small 1/4" cubes. I added them to the slow cooker, along with a medium Vidalia sweet onion, cut into inch-long 1/4" sticks; 4 cloves of garlic (grated with the Grill Friends' super grater - but it's difficult to hold on to the garlic at the end, so I chopped what I couldn't grate);one small delicious heirloom tomato, deseeded and cut into 1/4" cubes; 1/2 teaspoon or so of salt as well as of freshly ground pink peppercorns; 2 teaspoons of dried thyme; and 5 tablespoons of olive oil. I had some (about 10 tablespoons) of the liquid from Tuesday's tomato salad, and added that, as well. I was going to dice half of a yellow bell pepper, but the slow cooker was full! I am going to leave a note for my wife to start it cooking around 11a so that it will have 7 hours to cook on low by 6p; I'll then plan to quickly open it and throw in a teaspoon or so of fresh oregano, and let it cook for another half hour or so, then serve it over pasta. I'm back to cooking! Today my gums seemed to be ready for more substantial food, so I put together a simple and soft meal with toned down spices ... and, it so turned out, no added salt or oil! I started by preparing a Thai tomato salad, similar to a recipe in my self-published cookbook that my students make when we do Thai and Indonesian cooking. Into a metal bowl, I diced a lovely large heirloom tomato into small pieces (maybe 1/4"), and added 2 teaspoons each of ume plum vinegar and a lime juice mixture that includes lime oil (lemon or lime juice would also have been fine). At the annual sale that we have at a nearby gourmet food store, A Southern Season, I picked up very inexpensively a small ceramic plate with rough center by a company called Grill Friends; this "super grater" can be used to quickly and easily grate garlic or ginger (after moistening the plate with oil or water), as well as, dry, nutmeg and chocolate. I gave it a try with a clove of garlic for the tomatoes, and it worked well! I also added about a quarter of a jalapeno pepper and about a half dozen fresh basil leaves, diced finely; I mixed the tomato salad and chilled it for at least a half hour, covered. I made a simple rice noodle dish by boiling rice noodles just a few minutes till they were nice and soft. I made a sauce by putting into a small pan 2 1/2 tablespoons each of creamy peanut butter and bottled Indonesian peanut satay dip, as well as a tablespoon of water. As I gently heated, stirring over low-medium heat, I added one and then a second tablespoon of water (for a total of 3 tablespoons), stirring all the ingredients together. I mixed the sauce into the noodles and served. Before my dental work, I had purchased some prepared Tom Yum soup that came in a foil package that just had to be boiled for 5 minutes, and I also made that; it was actually quite good with nice, tasty mushrooms! 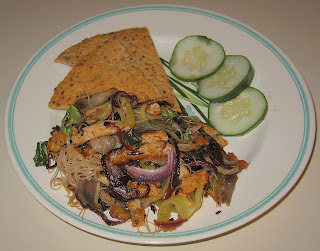 Dinner turned out pretty good - the salad was excellent, the soup surprisingly good, and I liked the noodles, though my wife thought they could have been more spicy. It's great to be cooking - and beginning to be eating somewhat normally - again! It's been a long time since I've cooked! My oral surgery recovery was such that I was still having significant pain until just a day or two ago, and I have been relying on cream of wheat for breakfasts and mashed potatoes for dinner. Tonight, I made some simple boiled rice noodles with Thai peanut sauce, creamy peanut butter, and hot sauce mixed in. My wife has been tiding herself over. But I think that tomorrow or Wednesday I should be able to start cooking and enjoying food again! 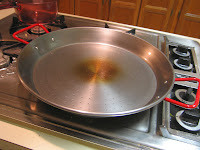 I did want to report on an exciting new purchase that I made last week, a traditional 13.5" polished steel paella pan that is described as being large enough for serving 3-4 people. Paella is a traditional Spanish rice dish made from rice, olive oil, and saffron, along with vegetables (or non-vegetarian fare) that is cooked in a wide and shallow pan. The vegetables are first stir fried, rice added, then vegetable broth added and brought to a boil, then the heat is reduced and brought to a simmer till the rice is cooked. With the heat turned off, the pan is covered for a few minutes before serving. I can't wait to try my hand at it! I also purchased some interesting spice rubs, and will try them with seitan, tempeh, and vegetables.